"The World Security Network promotes a new Double Strategy for Afghanistan. The strategy should combine two equally weighted pillars: a rapid civilian build-up in the provinces on one side, and on the other, effective military containment of the Taliban with as little collateral damage as possible. The old Afghanistan strategy was too naïve and has failed for five years." Fulfilling its role to promote fresh new ideas in foreign and defense affairs, the World Security Network promotes a new Double Strategy for Afghanistan. The strategy should combine two equally weighted pillars: a rapid civilian build-up in the provinces on one side, and on the other, effective military containment of the Taliban with as little collateral damage as possible. Over the next few months, we must get away from an exaggerated military approach, and escape from the political focus on constructing a strong central government in Kabul instead of local peacemaking at a village level. We must therefore address and change the highly uncoordinated and delayed civilian build-up so far, and should buy up all poppy production; something which met with great success in Turkey. The old Afghanistan strategy was too naïve and has failed for five years. To continue in the same vein will lead to NATO’s first severe defeat at the Hindu Kush, and a victory for the Taliban. Our WSN Editor Pakistan, Sahabzada Abdus-Samad Khan in Islamabad, exclusively interviewed Pakistani Lt General (ret.) Asad Durrani about the Pakistani point of view and allegations that the ISI is supporting the Taliban against NATO. General Durrani was Head of Military Intelligence and ISI 1988-1992, Commandant of the National Defence College, and Ambassador to both Germany (1994-1997) and Saudi Arabia (2000-2002). Our WSN Editor NATO, Benedicte Borel, analyzed NATO's mission and planning for a victory in Afghanistan. Robert E. Hunter, former U.S. Ambassador to NATO, emphasised Afghanistan’s importance in an exclusive interview with WSN TV. NATO, he said, is “betting the Alliance on success". He commented that while NATO is performing extremely well there militarily, "the outside world is not doing enough on economic reconstruction”. He argued that to improve the situation, "the European Union should take responsibility for coordinating and making coherent the civilian side of efforts in Afghanistan”, and appoint a top-level representative to work on the ground and generate the momentum required. "NATO should buy the whole poppy production for the next years - as successfully done in Turkey 30 years ago." 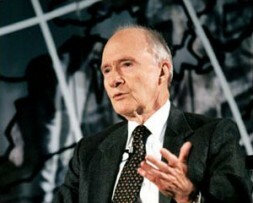 proposed former U.S. National Security Advisor Brent Scowcroft in an exclusive WSN TV interview. Fresh new approach: NATO, the EU, the UN, and all Western countries - especially the U.S. Government - need an urgent re-assessment of all military and political tools and elements for Afghanistan. There can be no taboos and no continuation of the old strategy. The aim is to formulate a new Grand Strategy for Afghanistan, taking into account all the last few years’ know-how, the historical experiences of the British and the Soviets, as well as a more psychological approach. Double Track Strategy: a combination of two pillars in synchrony with each other: first, a balanced and combined battle plan for military containment of the Taliban; second, a rapid civilian build-up in Afghanistan’s villages with a short term action plan supported with the large direct funds of NATO, the EU, and the U.S.. The civilian build-up should not wait until after a military victory, but both actions should be taken in parallel. Each NATO commander, down to company level, should be assigned a civilian coordinator. NATO and the EU should plan, with the help of the UN and NGOs but independently where necessary, detailed actions for every village, each valley, and all cities throughout 2007-2009. The necessary steps should be taken aggressively now, instead of losing more and more time - and potentially the whole war. Act now, do not wait: NATO and the EU should act immediately. Neither should wait for the Afghan government, which will likely not work rapidly enough, is divided in authority, and too weak. The Kabul government only needs to agree on the general concepts offered by NATO and the EU. Both organisations should speed up all important civilian programs like a police force, judiciary systems, schools and so on in cooperation with the government, the UN and NGOs. Focus on local peacemaking: peacemaking should be focused at the local village level, not on a strong centralized Kabul government; only this focus truly reflects the historical tradition and reality in Afghanistan. NATO should provide enough cash and other incentives to get local peace agreements signed, as this is a much cheaper and more fruitful way of peacemaking than military operations. Recruit local police forces for local areas: follow the best practice of the Khyber Guards, established with great success by the British in the 19th Century. Today they are able to keep the vital Khyber Pass route between Peshawar, Pakistan, and Jalalabad, Afghanistan, quiet and peaceful. Doing this, NATO can absorb many aggressive young men in the provinces, give them employment, a personal future, pride, and integrate them into a more localised security system of NATO in Afghanistan (see Hubertus Hoffman on Afghanistan & NATO's Mission Impossible). 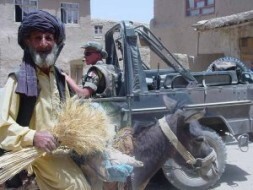 Show respect to the local people in every way: win their hearts and minds, especially in areas where the Taliban operates. Provide several billion dollars to those areas – it would still cost less than military action. Do not create more enemies than you kill: minimize the use of force, especially by the U.S. Air Force, with maximum control of possible collateral damage, so NATO does not kill 10 Taliban with massive bombing but produce 100 fresh warriors in the process. "Talk softly, but carry a big stick": the Double Strategy needs both pillars to be implemented. The military pillar must not be neglected, and NATO must maintain a credible military toolbox in the region, including effective surgical strike capabilities to neutralise the most dedicated Taliban forces. All units or equipment the ISAF Commander requires should be provided immediately by NATO member states under the conditions of minimising collateral damage and facilitating the pillar of rapid civilian build-up as described. Start a political reconciliation process on all levels: force the integration of the Pushtun tribes of the South into the Kabul central government. Coordinate effective border control with the Pakistani government and equip the Afghan and Pakistani border police well. Start a personal reconciliation process between Afghan President Karzai and Pakistani President Musharraf, who do not at all get on; this is best coordinated by German Chancellor Angela Merkel, as for historical reasons Germany is the most respected NATO member state in both countries of the region. Build up a new, young elite for Afghanistan, including a data bank, and support them with a massive mentoring program funded by the EU and the U.S.. Transfer the power to these younger men and women, the future of Afghanistan, as soon as possible.